2010 Indian Premier League - IPL3 Mumbai Indians beat Delhi Daredevils 47th Matches win 39 runs, Tuesday, 13th April, 2010, at Mumbai. MI 183/4 in 20 overs while DD made 144/7 in 20 overs. man of the Match is Kieron Pollard who made 45 runs. 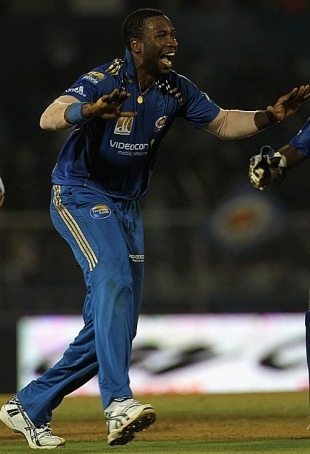 Mumbai Indians Kieron Pollard finally lived up to his bumper signing with a brutal innings that undermined what, for the most part, had been a spirited performance from His 13-ball 45, laced with five sixes, powered Mumbai to a challenging score to which Delhi, despite their power-packed line-up, failed to measure up. Delhi Daredevils who had kept Mumbai on a leash for much of their innings, faltered badly at the death. And when David Warner and Virender Sehwag had blazed away in their chase, they squandered the early edge despite reprieves offered by Mumbai's fielders. Toss - Mumbai Indians, who chose to bat. Result - Mumbai Indians won by 39 runs.